Being one of two Select Registry Inns in Oklahoma, the Montford Inn and Cottages set out to provide an amazing guest experience through a custom-designed Inn, unique amenities, and amazing hospitality. Located in the heart of the historic district of beautiful Norman, Oklahoma, quaint beauty and charm await guests at every turn. And now, one of those turns includes a Tesla charging station. 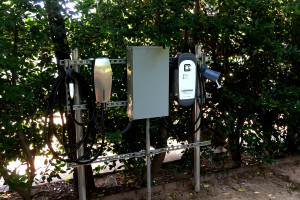 The Montford Inn and Cottages has teamed up with Select Registry and Tesla Motors to provide an increasingly desirable amenity; Tesla Destination Charging. Tesla High Power Wall Connectors add 58 miles of range per hour to Model S, charging the vehicle overnight and replicating the convenience Tesla owners are accustomed to at home. The charging station at the Montford Inn is the closest charging station to the University of Oklahoma, the first in Norman, OK, and the first at an independent hotel in the Oklahoma City area. Tesla changed the auto industry in 2008 with the launch of the Tesla Roadster. And Tesla is on a mission to drive down the cost of electric vehicles with Model S, the first mass-produced electric premium sedan. Model S is the world’s first premium sedan built from the ground up as an electric vehicle. The proven Tesla power train is at the heart of the Model S which delivers both unprecedented range and a thrilling drive experience. It also boasts a nearly 50/50 weight distribution and a remarkably low center of gravity; Model S offers the ride quality of a luxury performance sedan while providing the responsiveness and agility expected from the world’s best sports cars. Select Registry is a portfolio of more than 300 quality-assured premier bed and breakfasts, inns, and hotels throughout North America. Each of our member bed and breakfasts, inns, and hotels has passed an unannounced, rigorous, 200-point quality assurance inspection to earn and maintain its Select Registry membership, and to ensure it provides travelers with guaranteed quality, exceptional service, and an unforgettable lodging experience. The Montford Inn has two charging stations – a 50 amp Tesla charger and a 40 amp general electric car charger. Guests can charge their cars for free, as part of the inn’s amenity package. Members of the community and public can charge their cars for a $10 fee.